Below you will find a list of frequently asked questions. And we added a few that might get asked in the future, for good measure. If you have detailed questions about the software, you might want to check out our New User Center or our Software Reference. We also have some tours and tutorials here. EnterYourHours.com is an online invoicing and tracking system for businesses that bill by the hour. 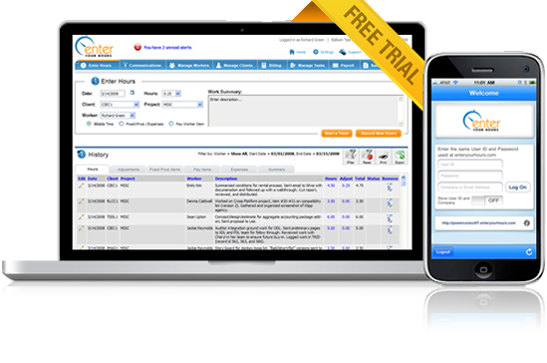 The EYH System allows you and your staff members to enter hours into one streamlined system, create bill batches and payroll batches, customize invoices, manage tasks, communicate with one another, view extensive reports, and do it all on your own secured, private website. If you want to try it for free, go to our 30-Day Free Trial page. If you have further questions email us at info@enteryourhours.com or call us toll free 866.456.9326. Please refer to our Price Sheet for information about our price plans. Yes and no. EnterYourHours.com handles many accounting features, and for those that it doesn't, you can integrate with QuickBooks. Not only does it integrate with QuickBooks, but you can also export almost any piece of data out in a easily readable format, such as Excel or csv. Even without QuickBooks, or exporting data, you can use EnterYourHours.com to handle all of your "books", but whether you want to use it alone is a decision for you or your accountant. EnterYourHours.com is streamlined for ease-of-use for businesses whose core revenue is hourly billing. In that regard, EnterYourHours.com allows you to enter hourly billing, fixed-price, and expense information, batch bills and payroll payments (so you don't bill or pay them twice), create invoices automatically (and from scratch), receive payments, and check A/R aging. EnterYourHours.com does not use double-entry accounting methods or work with a general ledger. It does not include some other typical accounting software features such as creating credit-memos and storing inventory. Can multiple members of my staff use the system and will it combine their hours into one invoice for a client? Yes, and it will do it in seconds. Does enter your hours track expenses? Yes, and it will automatically bill the client for it, and add it to the payroll reports. I also sell products and do work for flat fees. Can EnterYourHours.com handle this? What kind of reports does the system give me? For those with administration rights, data from every screen is filterable and exportable, so you can create pretty much any adhoc report you want. When you batch hours for invoicing and payroll, reports are automatically created for hours, revenue, and costs for every client and staffmember. Additionally the system has aging and profit and loss reports of every shape and size. Most reports can be viewed in xls and pdf formats. All data screens have a printer-friendly version. Yes, in a variety of ways. You can roll up hours or break them out by project, activity, or even worker. You can include a logo, hide specific columns, add memos to your coverage page, show section sub-totals and more. There are so many features, that we've created a separate page with samples. Yes. At the press of a button. Will it work with my computer and browser? EYH is designed for Windows PCs running Internet Explorer 6.0 or later, or Firefox 2.0 and later. I already have a contact database, will I be able to import them into EYH? Yes, with the Premium or Enterprise Pricing. If you wish to import or synchronize your QuickBooks customers, that is available with all plans. Can I view the hours my staff enters for a client? You can if you have administration rights. Administrators can bill their own hours and edit staffmember's entries. Can I communicate with my staff members about projects with EnterYourHours.com? Yes, there is a communication screen. Administrators can also set alerts that will appear on your company's private EYH website. What about paying my staff members for the hours they bill. Does EnterYourHours.com track that as well? Yes. The system will give you complete control of paying your staff members. You can pay them for any period of time, control which staff members get paid and when they get paid. You can block payments for a particular client, and even block all payments for hours that have not been billed to a client yet. There is a variety of other ways to control payroll. See our help files (available from the homepage) for more information. What if I need a change for the software. Can you customize it? We have the capacity to create custom screens and functionality. Call our toll-free 866.456.9326 to set up a free-consultation phone appointment with one of our system architects. How do I know my customers' information will be safe in an online piece of software? The security of your data is our number one priority. To this end, the entire EYH System is SSL secured, and tested on a daily basis by McAfee® Secure (previously HackerSafe.com). The EYH Servers are protected by a Class-C Firewall and are housed in one of the most secure data centers in the US. Your data is also backed up on a nightly basis. You can view our Information Security Policy for more information, or you can call us toll free 866.456.9326 and schedule a call with one of our network specialist to answer any of your concerns. Can I enter payments and track the aging of receivables? Call us toll free 866.456.9326 or email us at info@enteryourhours.com. We would also recommend starting a Free Trial.